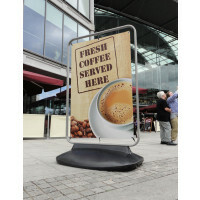 Street Boards are powerful advertising tools that you can adopt for marketing your business. 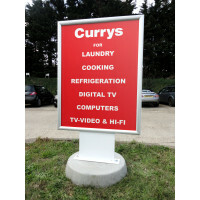 These work for both small and large business and are very popular amongst the exhibitors. 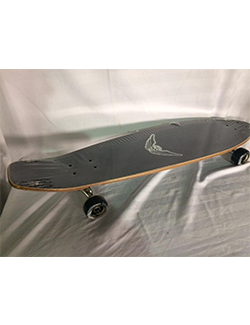 We offer you some street board options from which you can select the one that caters to your need. 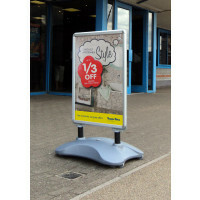 We have XL Poster Master, a double-sided forecourt display made of stainless steel to increase weather resistance and durability. The magnetic poster also keeps the posters in place by covering them. It also has built-in wheels for easy transportation from one advertising location to another. You can go for this outdoor display stand if you want to beautifully exhibit your brand within a minimal space. If you wish to increase your brand recognition outside coffee shops and other retail stores, the XL Swing Master is a very apt option for you. Made with a water fillable polyethylene base using recycled materials, these are very stable against harsh winds and rough weather. The black color can go according to your business décor and also hides dirt and marks. You can also choose your desired colors to complement your décor. 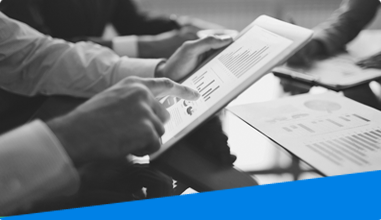 The built in wheels are yet again a huge advantage that our products offer to you. Our other products also include similar water bases and heavy duty mounts ensure stability by allowing the panel deflection in the course of the wind. 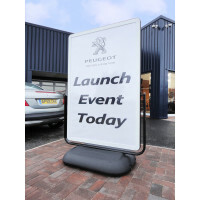 You can also opt for our durable framework show boards which have double sided display, increasing exposure of your brand information to the audience, and the rates of customer retention. 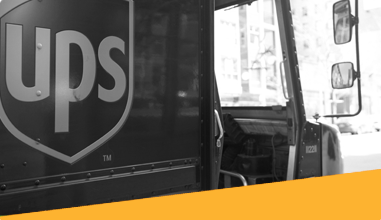 We also consider the safety of our customers as our top most priority. Hence these street boards have round corners and no sharp edges so no one gets harmed while transporting these from one site to another.